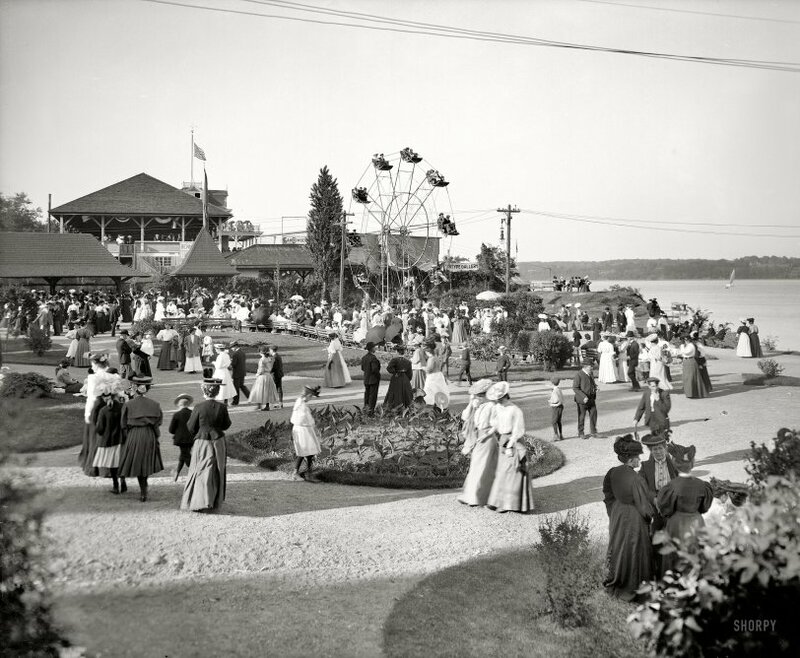 Kingston, New York, circa 1906. "Kingston Point Park." 8x10 inch dry plate glass negative, Detroit Publishing Company. View full size. Submitted by Gretchen on Sat, 02/02/2019 - 11:33pm. My great-grandfather was 12 in 1906, and lived in Kingston. He could be one of the children in this picture. Submitted by lthing on Fri, 01/01/2016 - 8:06am. Kingston Point Park was not designed by Calvert Vaux but by his son, Downing Vaux. You can read more about it in my book, "The Street That Built a City - James McEntee's Chestnut Street, Kingston, and the Rise of New York." Downing Vaux designed the park for Samuel Coykendall as a gateway to the Catskills using his Ulster and Delaware Railroad. Submitted by 2liteguy on Wed, 10/26/2011 - 5:29pm. I had the privilege of being able to visit this park just recently. While it is nothing today like it was in its heyday, it remains quite beautiful and a fine reminder of how talented Calvert Vaux (the designer) was. I wish there were sound. Submitted by rgraham on Thu, 06/03/2010 - 11:42pm. I'll like to hear some of what consisted of conversation back in the day. Local news and gossip most likely, with very little international talk. The world was much larger back then. Perhaps the town band was cranking out some J.P. Sousa tunes to liven things up. The only point of going to the fair. Submitted by jennahw on Thu, 06/03/2010 - 10:19am. No funnel cakes, no deal. Submitted by Anonymous Tipster on Thu, 06/03/2010 - 6:09am. The photo has a Seurat like quality to it. Submitted by Bob Wilson Jr on Thu, 06/03/2010 - 5:40am. Born near here 30 years after this picture was taken, and 30 miles south of Kingston. My great-granddad was a riverman, piloting a brick barge up and down the Hudson back in those days. Sadly, those days are gone forever for towns like Kingston, Poughkeepsie and Newburgh. So they are for my great-grandfather, who died in 1913. Submitted by Sean Ryan on Thu, 06/03/2010 - 1:07am. Submitted by Ypiranga on Wed, 06/02/2010 - 8:38pm. Fantastic image and new screen saver. Keep them coming! Submitted by Jano on Wed, 06/02/2010 - 7:59pm. Yelling "BUNTING!" is the recreational variant of shouting "BOLLARDS!" in the city. Submitted by Anonymous Tipster on Wed, 06/02/2010 - 5:03pm. That Ferris Wheel looks a bit ... flimsy. I think I'll pass and go have some clam chowder (or is that "chowdah?") instead. I want to take every adorable young person in this photo home with me. I think I like the teenage boys best, in their natty suits and straw hats. I also note that it appears to be possible to tell a girl's exact age by the length of her skirt. If I ever form a fundamentalist religious cult, this is how my minions will be required to dress. Men as well as women, none of that "women in prairie dresses, men in polo shirts and shorts" nonsense. Submitted by Anonymous Tipster on Wed, 06/02/2010 - 3:53pm. No one eat the clam chowder and then go on the Ferris wheel, ok? Submitted by Anonymous Tipster on Wed, 06/02/2010 - 2:48pm. we can see an impromptu meeting of the Sour Persimmons Ladies Auxiliary. Submitted by Anonymous Tipster on Wed, 06/02/2010 - 2:42pm. Today's Rotary Park was a stop for the Hudson River Day Liners, so many of these folks might be up from the city for an outing. Submitted by brucet45410 on Wed, 06/02/2010 - 2:30pm. Kingston sideshow barker screaming, "Hurry, hurry, step right up to the terrifying "Decagon!" Submitted by Mister Peabody on Wed, 06/02/2010 - 1:55pm. I see two ladies without the requisite hat. Submitted by Big Mike on Wed, 06/02/2010 - 1:31pm. Would that dressing in the clothes of the time and starring intently at this wonderful photo allow me entrance for a day into this scene and time as Jack Finny projected in his 1970 novel, "Time and Again." Submitted by bdev on Wed, 06/02/2010 - 1:24pm. Reminds me of that Twilight Zone episode. "Willoughby ... next stop, Willoughby!" Submitted by OTY on Wed, 06/02/2010 - 12:33pm. This looks like an idyllic movie set for a Technicolor musical about the early 20th century. Sometimes we must ask ourselves "Are we really evolving or are we regressing?" I'm just sayin', picture this same setting in New York today. Submitted by SHORPAHOLIC on Wed, 06/02/2010 - 12:22pm.